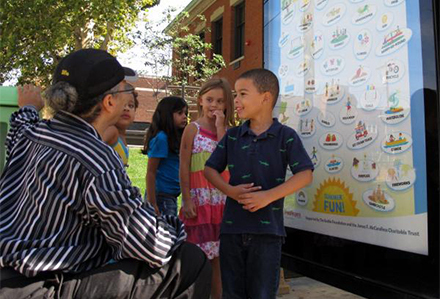 Thanks to WORD PLAY, a game developed by The Fred Rogers Company, waiting for the bus or riding the light rail system, can be a fun learning experience for children and parents to play together. 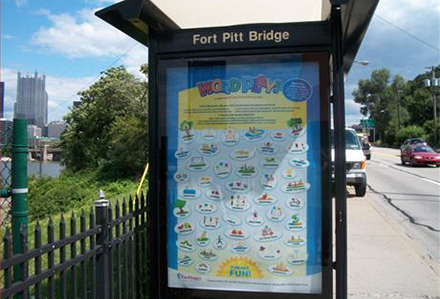 Colorful WORD PLAY posters are displayed in 23 of Lamar Advertising Company’s transit shelters throughout the City of Pittsburgh and on Port Authority light rail cars. The campaign started in August with a “Summer Fun” poster theme, featuring images of objects and activities associated with summertime. Continuing through October, the bus shelter posters have a new theme, design and word game to play each month. 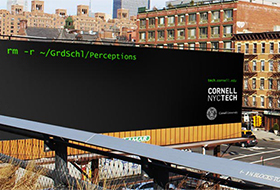 A WORD PLAY display running on one of Lamar Advertising Company's Transit Shelters in Pittsburgh. WORD PLAY’s eye-catching, child-friendly public art offers parents simple prompts which can be starting points for learning and having fun with words, sharing observations, comparing and contrasting pictures and making up stories about them. Parents are also encouraged to use their cell phones to record their children’s stories and ideas about the pictures and share them with family and friends. “WORD PLAY is based on well-documented research confirming that parent-child communication has a significant impact on the development of a child’s vocabulary, reading skills, self-esteem, imagination, and overall approach to learning,” explains Margy Whitmer, WORD PLAY Project Manager and Media Producer at The Fred Rogers Company. “Through everyday experiences like waiting for the bus or riding the train, playing and learning happen together in WORD PLAY,” she adds. Originally funded by the Sprout Fund, WORD PLAY was piloted last summer in seven shelters primarily in the City’s East End. Additional funding to continue the project this year was provided by The Grable Foundation and The James F. McCandless Charitable Trust. Creative tie-ins to local preschool and child care programs are additional elements of the WORD PLAY concept. A teacher plays WORD PLAY with a group of preschoolers on the South Side. Photo courtesy of WESA, Pittsburgh's NPR News Station. A list of the transit shelter locations and poster images are available at www.fredrogers.org/wordplay. For more information about WORD PLAY please, contact Margy Whitmer at 412-605-3112. October is Breast Cancer Awareness month, and the Komen Foundation is using technology and social media in an innovative campaign to promote its Race for the Cure in Knoxville, TN. It’s easy to get involved – all it takes is a tweet. 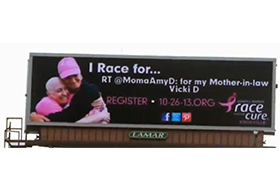 People can show support for a loved one affected by breast cancer by tweeting their name with the hashtag #knoxRFTC, and it will appear on Lamar Advertising Company’s digital billboards throughout Knoxville.